Victoria Falls is the world’s largest waterfall. This designation comes from calculating its width and height together. The result is the single biggest mass of the flowing water. It is located on the Zambezi River on the border between Zimbabwe and Zambia. One can hear its roar from 40 km away, while the mist and spray from the falling water rises up to 400 m. This mist, combined with the right angle of sunlight, can create spectacular rainbows. The waterfall stands at an altitude of 915 meters above sea level. It spans to about 1,708 meters wide with a depth of 100 meters, the deepest point being 108 meters. The river system has cut through rocks producing a series of 8 gorges that serve as the breeding sites for four species of endangered birds. Victoria Falls is wider than the Niagara Falls and is two times the height. Peak flood waters occur around April. During this time about 625 million liters of water pour over the edge every single minute. 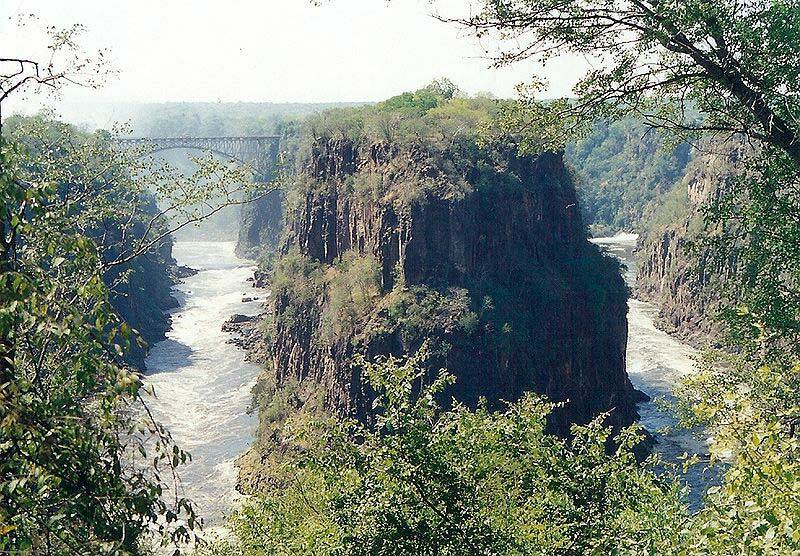 The latest geographical history of Victoria Falls can easily be seen in the form of the gorge beneath the falls. The basalt plateau over which the Zambezi River flows has large cracks filled with weak sandstone. The biggest cracks run from east to west, with the smaller north to south cracks linking them. During the Jurassic Period, lava erupted and covered huge areas of Southern Africa. These dark basalt deposits are now the rocks forming the sides of the gorges beneath Victoria Falls. Thousands of years ago, the Zambezi River cut through these deposits and created the initial series of waterfalls. The Zambezi River continues to cut through the clay and limestone to this day. One can see the progress just by looking at the series of 8 gorges that were formed by the retreating waterfall. It is believed that the Devil’s Cataract, the lowest point of the Falls is the start of the next gorge. 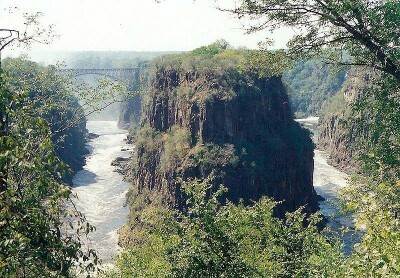 Victoria Falls area is very rich in early Stone Age sites. Various tools found in different places are of the Oldowan tribe, referring to the group of people in Olduvai Gorge in Tanzania. The earliest inhabitants of the area around Victoria Falls were the Khoisan people. They were followed by the Tokaleya, who named the falls Shongwe. Later, the Ndebele people called it Manza Thunqayo. 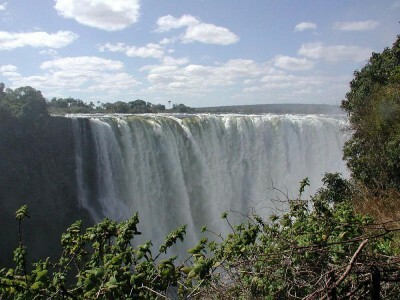 Victoria Falls were discovered on November 17, 1855 by the Scottish missionary David Livingstone. Livingstone discovered the falls during his 1852 to 1856 trip down the Zambezi River. Livingstone was taken to the Falls by the Makalolo people in a canoe. He reached the falls from upriver and rowed across to a small island, now known as Livingstone Island. Although David Livingstone had previously been stunned by Ngonye Falls upstream, he found the new falls more impressive, and he named them after the reigning queen at the time, Queen Victoria. The powerful curtain of water that forms Victoria Falls is known as Mosi-oa-Tunya or “Smoke that Thunders” by the locals. Most of the region’s people still use this name. When Livingstone discovered Victoria Falls in 1855 its popularity grew fast. The Falls started to draw Anglo traders. A rustic trading settlement was then set up on what is currently the Zambian riverbank and it became the Victoria Falls town known as Old Drift. The number of tourists rose steadily and people walked, traveled by ox-wagon, and rode on horseback from the South Africa just to see the Falls. In 1989, Victoria Falls was declared a World Heritage Site for being among the world’s most spectacular waterfalls.